With an ultra-modern design, Detecto's stainless steel digital health care scales offer an extra-tough finish which stands up to water damage from mopping around the base and high-humidity areas such as locker rooms. Enjoy the power of digital weighing with the convenience of “at-a-glance” weight readouts and an AC or battery-powered LCD display. 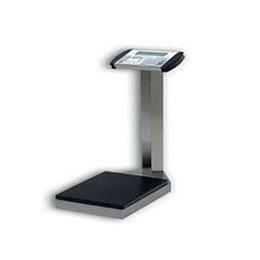 With the push of a button, readings appear in pounds OR kilograms. Platform Size 10 1/2" x 14 1/2"